What are the misspellings for leave? 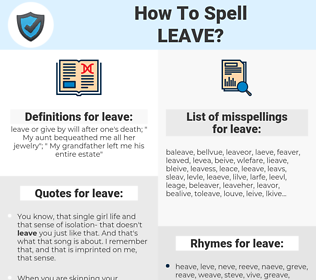 What are the common mistypes for leave? What is the definition of leave? What are the quotes for leave? What are the rhymes for leave? What are the translations for leave? 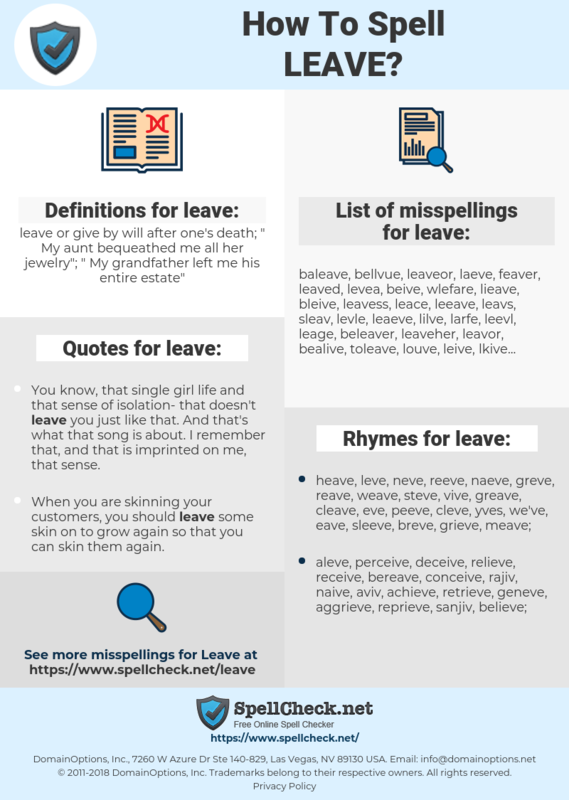 What are the common typos for leave? This graph shows how "leave" have occurred between 1800 and 2008 in a corpus of English books. You know, that single girl life and that sense of isolation- that doesn't leave you just like that. And that's what that song is about. I remember that, and that is imprinted on me, that sense. It is foolish to pretend that one is fully recovered from a disappointed passion. Such wounds always leave a scar. It took the producers a while to realize I wanted a full -bodied life. I wanted to get out before I felt I'd sacrificed so much to get somewhere that I couldn't afford to leave. 离, 假期, 撤出, 离去, 走人, 起程, 动身, 遗弃, 告别, 走掉, 别离, 抛离, 违别, 请假. verlaten, vertrekken, overlaten, weggaan, achterlaten, vakantie, verlaat. sortir, laisser, partir, quitter, délaisser. Erlaubnis, lassen, Genehmigung, aufgeben, fortfahren, belassen, geben, verlassen, überlassen, gehen, weggehen, hinterlassen, abfahren, Urlaub, fahren, Beurlaubung, ausscheiden, Abschied, übrig lassen, zurücklassen, liegen lassen, abreisen, fortgehen, austreten, vererben, wegfahren, losgehen. 離れる, 有給休暇, 去る, 出ていく, 失礼, 外す, でる, 出ず, はなれる, いでたつ, でてゆく, ほっぽかす, 離る, ころがす, まかりでる, たちさる, 避る, しりをあげる, ヒマ, リーブ, 引上げる, いなくなる, 引揚げる, 引きさがる, 転がす, ゆうきゅうきゅうか, はずす, 引き揚げる, 引き下がる, ひけ, 出てゆく, ずらかる, 去ぬ. sair, ausência, deixar, licença, esquecer, permissão. salir, permitir, expedir, dejar, abandonar, permiso, baja, vacaciones, irse, legar, acabar, licencia, excedencia, venia, zarpar, marcharse, retirarse de, alejarse de, dejar a la vista.